Width 39" Height 34-1/2" Depth 21" Vanity Console Sink Base Cabinet with natural finish interior. This cabinet has 2 doors and 2 top drawers, one located on the top left and one on the top right with a false drawer front in the middle. 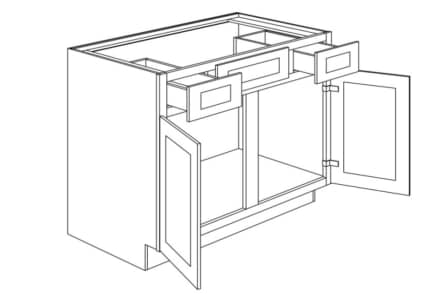 Cabinet features: 1/2" A-Grade Plywood Box, 6-Way Adjustable Door Hinge With 110° Opening Radius, Full Extension Undermount Drawer Glides (Soft-close drawers not available on this item), Solid Maple Face Frame, Solid Maple Door Frame With HDF Center Panel. This cabinet does have a center stile.